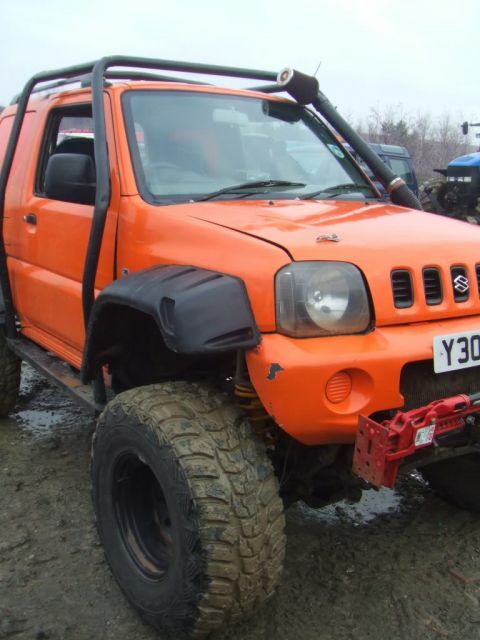 Got the chance of a jimny going cheap but dont know a thing about them. How good are they for off roading? 1.3L engine? Can it pull anything? What about a trailer behind it? Any simple - ish swaps available? Ive heard the axles are weak? Do you get upgraded shafts and CV's? What about tyres? Alot of people on 31's but a few 33's and fewer 35's? How would a jimny on 35's and a low range box with tein lockers compare to a defender 90 with the same spec? You're asking this question to a group of enthusiasts - you will get nothing but a biased answer. Much the same as if you ask a 90 driver if they are any good. I wouldn't want to tow anything with a 1,3 at all. I believe a 1.6 conversion is easy enough with either a baleno engine or a vitara engine. Still wouldnt want to tow much though. Anything above 31" is just for looks. Bigger tyres makes no difference offroad. But you'll need to fit a rocklobster transferbox if fitting tyres bigger than 215/70/15. What sort of offroading do you want to do with the Jimny? "How would a jimny on 35's and a low range box with tein lockers compare to a defender 90 with the same spec?" Is a 'cheap' jimmy worth anything to you personally if you are going to spend mega loads on parts? 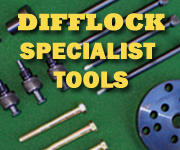 It may be better to spend a wodge of cash on something nearer to your final ideal vehicle? Anything above 31" is just for looks. Bigger tyres makes no difference offroad. Er, no. They really do. Perhaps for your occasional pay n play. But anything more serious, you don't need these big tyres on such short wheelbase. 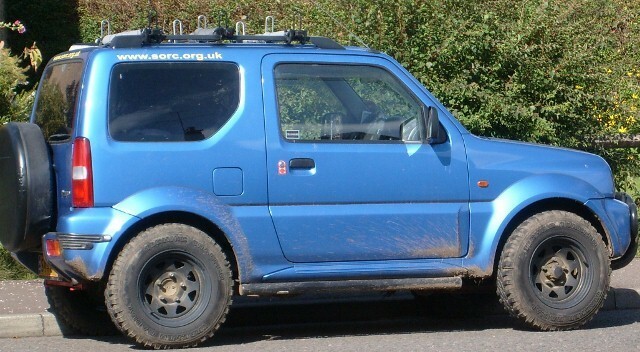 Also the Jimny is quite narrow, so with such big tyres, the COG will be unnecessary high. 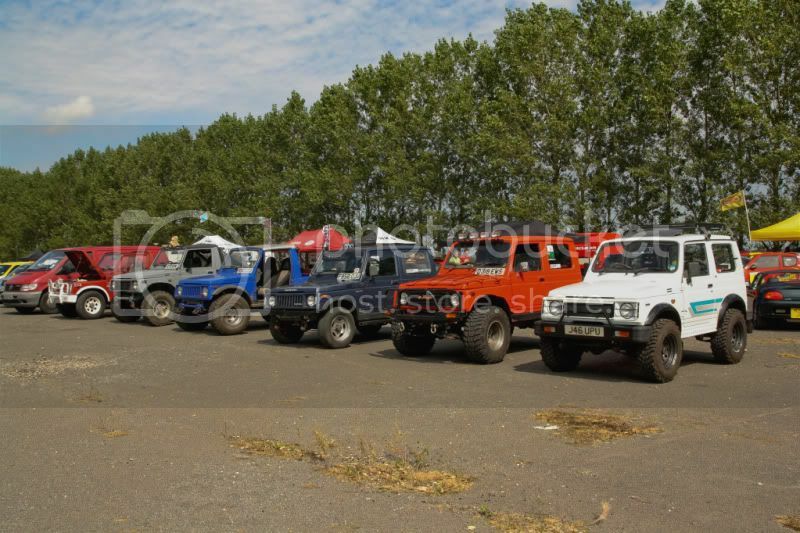 Look a some of the Comp-Jimny's and Samurai's. None of the run bigger than 31", a few 33". There's probably a reason why. We'll agree to disagree on this one!! All the comp SJs and jimnys I've seen have gone as big as possible, and 35s aren't uncommon. 33"+ are a benefit greenlaning when you get deep ruts too. I run 31" tyres on the vit and often ground out the diffs. Anyways for the OP, Jimnys are great offroad, But I also wouldn't want to tow anything with one. Big tyres will mean Â£Â£Â£ on suspension, low ratio boxes and uprated axles, although the axles aren't bad to start with. 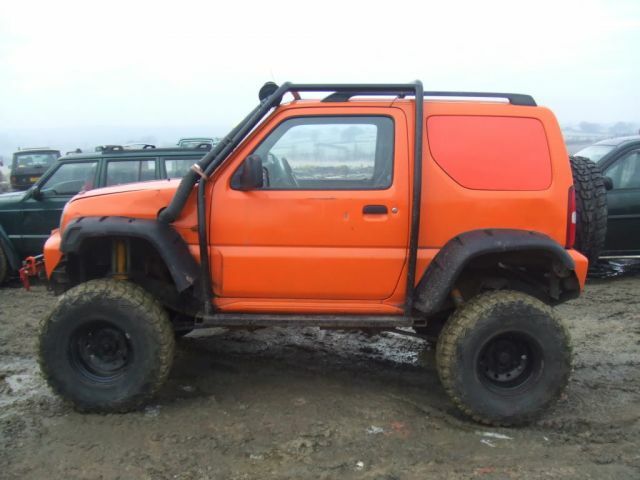 1.6 conversions are possible, and if it's an early jimny, you could fit a VW turbo diesel via an acme adapters kit. Thanks for all the replys so far. So 35's have been seen on jimny then? What would this require? 4" suspension lift? 3" bodylift? Can you get stronger halfshafts and CVs or would it be easier to put a new set of axles on? 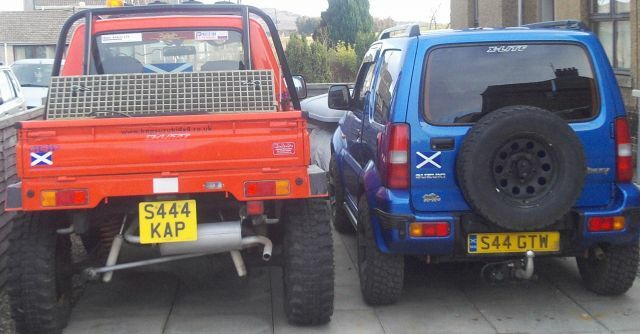 You will struggle to get really big tyres on a Jimny which is why most people run 31s or smaller. Have a look on bigjimny.com there are a lot of modded Jimnys on there. I run 33s on my Vit purely to cope with ruts. 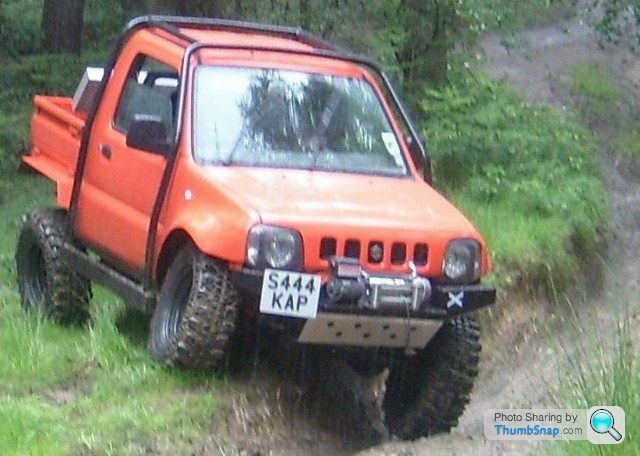 Now thats a nice jimny! Does anyone know what size of lift it has? 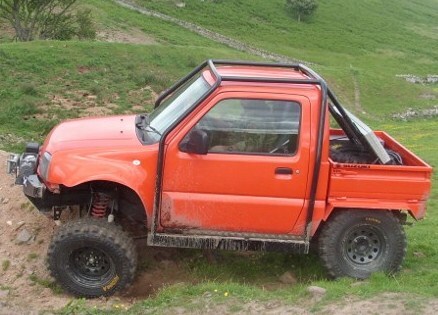 Ben is on here, but as it's on hilux axles, you can assume that it's custom and a lot! Ahh i see, a lot of hard work put in. Is there any more benefit to going yota axles instead of just pgetting stronger shafts and cvs made up rather than customising yota axles. One more issue ive been reading about are the wheel hubs. Ive read the vacum hoses seem to be a bit of a problem. Manual hubs can go on but the last thing i want to do is jump in and out to select 4x2 or 4x4. Id just like to use the trasfer lever , and not have to keep going in and out the car - do you get wheel hubs that allow this? Despite being a Landy owner I am also a dyed in the wool Zook fan - its where I started. I reckon that a well sorted Zook driven appropriately will go anywhere you'd want to. The only downside in my eyes is overall size and carrying capacity. Towing? I wouldn't bother. 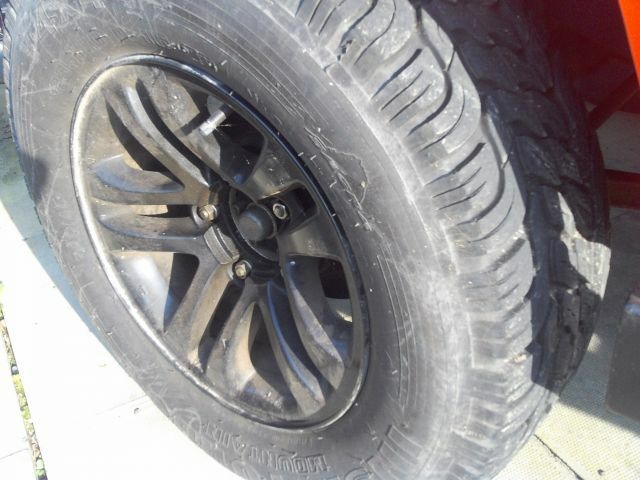 Huge tyres? 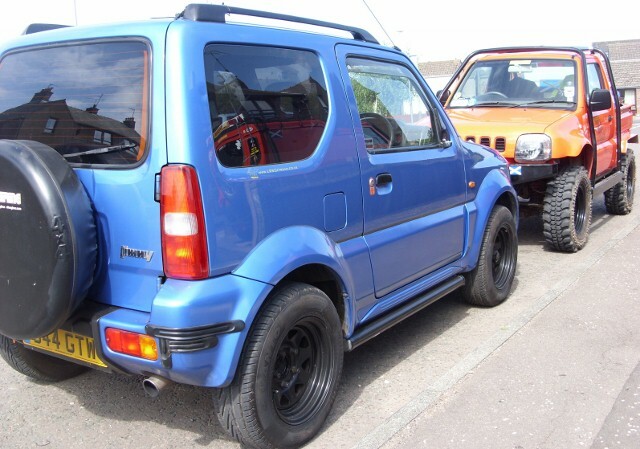 same, good 31" tyres underneath a good driver will go further than a fanny with 35"s.
If I were to sell my buggy I would get a Jimny like a shot. I know it's an SJ but running 33s doesn't always mean a high centre of gravity I'm sure you could go down a similar route with a jimny. What do you want to tow, because nothing to stop you towing a trailer. There are small caravans that you can tow. Or even towing out stuck 90's or 110's if you have the correct recovery points. All are capable enough off road. Big tyres with a 1298cc or 1328cc without changes to gearing can be problematic. and get you there and back on road. Id becwanting to tow a transport trailer with eith an off road buggy or 2 quads - so not too heavy. 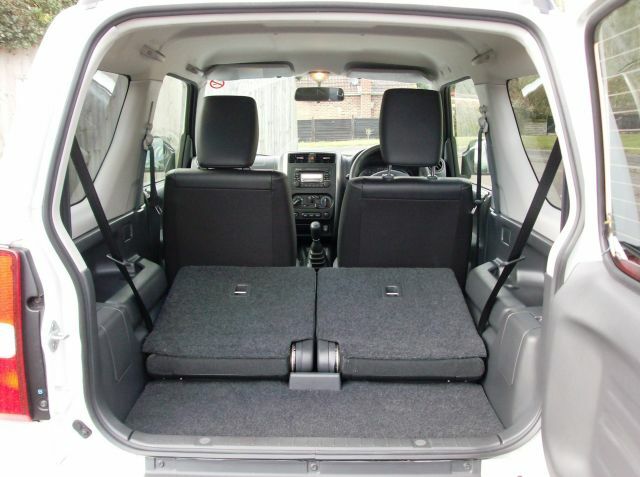 BOOT SPACE - how much space with the rear sieats down / taken out? HUBS - 4x2 and 4x4? 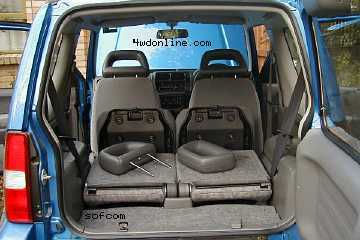 Do you get hubs that you dont need to keep gooing in and out of the car selecting 4x4 or 4x2? Id prefer just to stay in the car and select using the transfer lever. Spare Tyre - More aimed at off road users but where do you keep your spare tyre - eg would a 35 or 37" tyre fit it the boot ? Answer to first question might help, either standing up or lieing down? If not, where can it go? 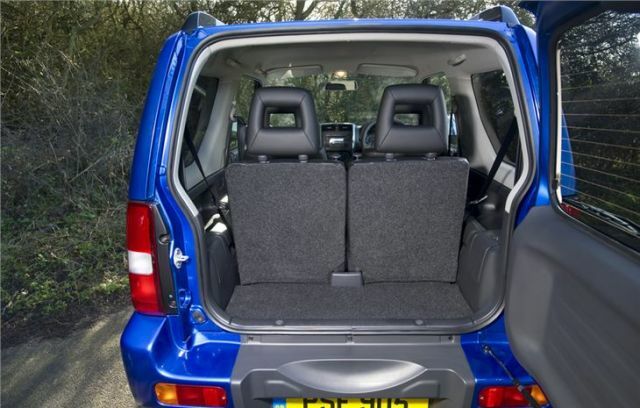 BOOT SPACE - how much space with the rear sieats down / taken out? not a huge amount, what are you looking at putting in? Max Unbraked is only 350kg & Braked 1300 kg. I tow a full size 4x4 Quad on the Braked Trailer the Quad then Tows. then you need to think about the Transporters Plated Weight. I have fixed hubs fitted, you can buy these or DIY. Described in BIGJIMNY.COM i think. 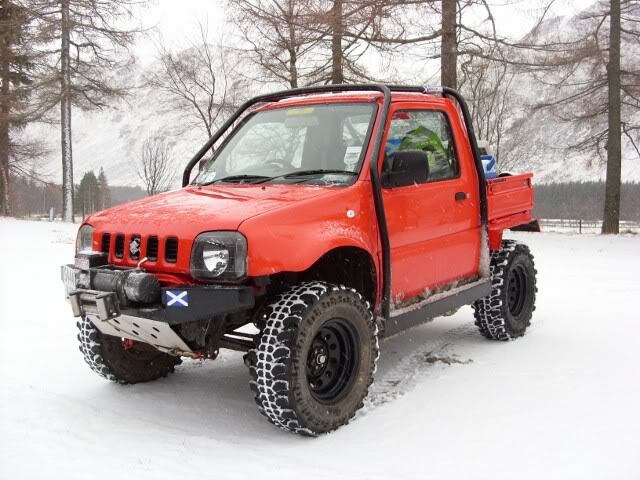 & the Jimny is in RWD unless the need for the front wheels driving. Low is not very low on a Jimny. I have Axles/Diffs from a Manual on Jimny's with Autoboxes. but still OK for nearly up to 60 mph on 31"tyres. 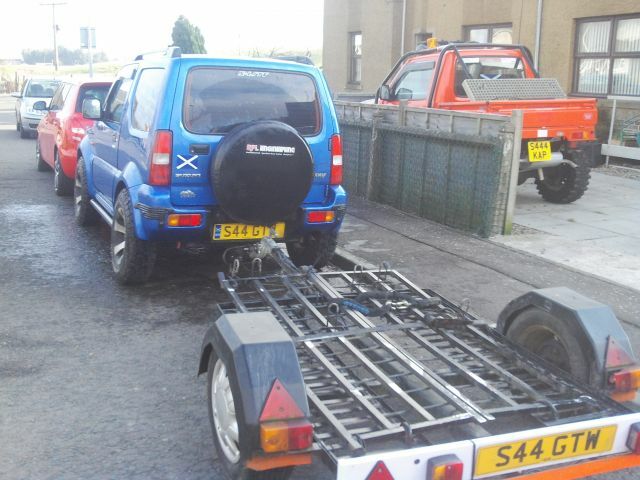 See in the Jimny Gallery for a Jimny with Internal Roll cage, Seat removed and spare wheel carried. 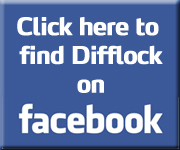 *** First & easiest place to look for rust. 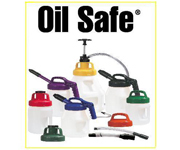 Open the rear door, and look there under the cover where the Jack is Stored. The Jack area looks an easy fix, but take that as a warning to what there might be elsewhere. Unbraked trailer, just used for carrying light stuff. The roof was the next thing that i was thinking, couldanyone measure in inche the length and height. Would it fit a 35x12.5 or 37x13.5 inch tyre? Or would it be best putting that on the roof? What about height, ive got a stand up toolbox that is 34 inches? I thought with the standard hubs the vacum hose caused a bit of a problem? They are vacuum hubs, you do away with that and fix them as on. That stops them from being a problem. Pretty heavy, heavy to get up there, and really not the best of ideas unless you are going to be making it a very wide Jimny. These tyres are only 235/75 15's and measure under 30"
Heavy enough when climbing slopes. and when filled with Mud. 195/80 15 Cheap Mud tyres on Standard height Jimny. 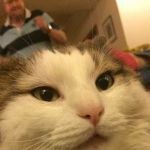 Its a friend of a family member up north that has one so i can get for fairly cheap but theyrnt home untill end of january so cant see / drive till then so thats why im trying to get as much info as possible here. If i do go for it then yes i am serious, i like to be a wee bit diffrent and tend to go OTT with things like this so 35-37 would be my aim. Where could a spare tyre of tgat size go tgen if it would raise the cog to much and to much weight up there for hills? 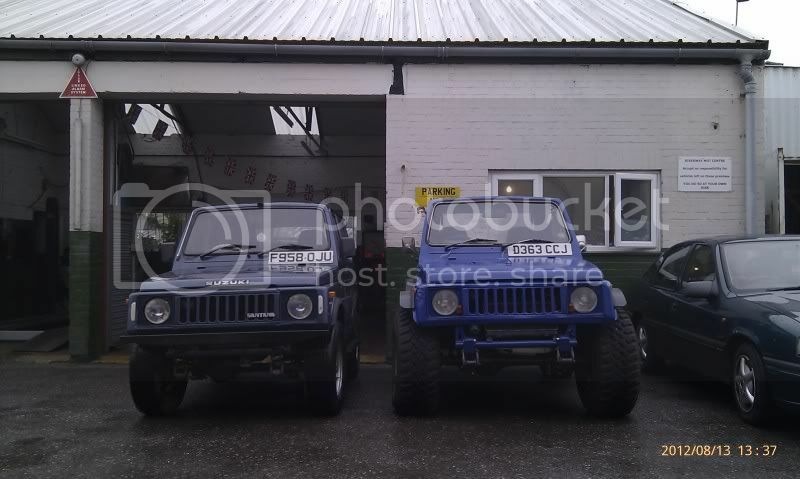 Isome of thoses jimnys do look great, makes me want one even more! Unless in a competition where it is required to carry a spare i would not carry a 35 or 37" tyre. The 4 that are fitted are more than heavy enough. Jimnys work best light. the go anyplace reputation comes from being light and agile. They are a revvy engine, certainly not big on torque..
What are you looking at a 1298cc 8 valve, 16 valve or 1323 cc DOHC? & being different with a Mini Monster truck is fair enough, but you are maybe going to need a bigger engine say a 1600 conversion or go diesel. 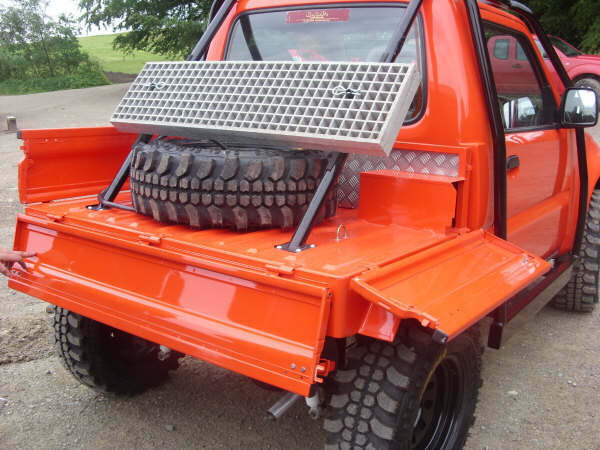 Or like the Big Orange Jimny Van, a Range Rover Rolling Chassis with a V8. I really fancy doing the rainforest challenge and a winch challenge aswell so as im planning on traveling i would like a spare, hense why im so concered about a tyre. Someone earlier in the thread mentioned 1.9tdi engine , i know a guy that breaks VWs so might be an easy option to go for the tdi as i can get alot of parts. I love the blue icelandic one, seeing that looking through arctic trucks and i fell in love with it! 5 years on from my posts above and my 2003 Jimny JLX Auto has another MOT pass. 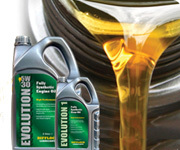 Worked out at about £1,100 a year for the 15 years with the purchase price and servicing and maintenance over the years. 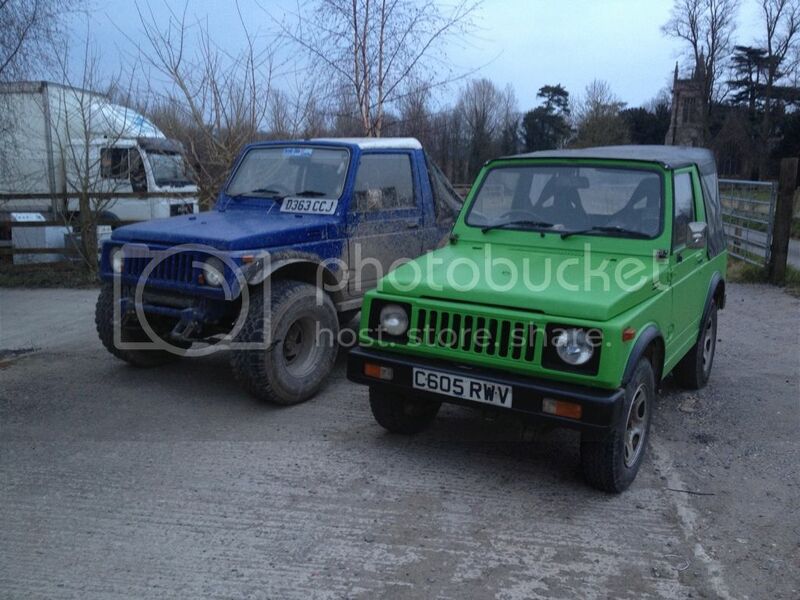 So no New Jimny needed for a while yet and i will be waiting to see if the New Jimny's have issues. First issue for me is the price of Automatics in the UK and bits and pieces i rather would not have. Then the crap Bridgestone Tyres that are fitted that needed changing right from collection. What annoys me with cars is that I want the powerful engine and good headlights etc but I don't want automatic gearbox, climate, touch screen etc. However they're all or nothing usually. The more modified the worse they become usually down to the paltry lawnmower engine not having the go to shift it. I owned that blue jimmy with the ext rollcage that everyone on difflock has also owned and it was so underpowered it was dangerous. Had I had the mechanical know how I would have swapped out the engine and kept it but at the time I had the first of my kids and it was just daft to keep it. 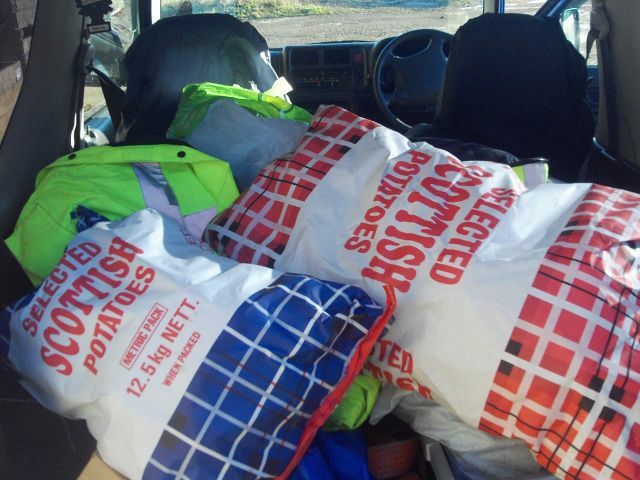 I had lockers winch and everything and it was like driving a bag of bolts... bloody loved it though! I like the look of the new one, suzi have done themselves proud with that by the look of things. Reminds me of a baby g wagon.